Expresing unhappy over silence of the Central and state government on the Chakma Hajong issue, the All Arunachal Pradesh Students Union’ (AAPSU) on Monday strongly demand that any how State government to pass a resolution against the granting of citizenship rights to Chakma- Hajong refugee in State, this up coming State Assembly Session. And failing which it has threatened to resort non-cooperation movement against the Centre as well as state government. AAPSU is fighting chakma-Hajong issue technically, Ideologically and peas fully, inform AAPSU president Hawa Bagang while addressing media person here at Arunachal Press club today and clarify that AAPSU is not going to give-up this issue, some sections of people siting inside within room trying to blame AAPSU through Social media by commenting against AAPSU, who is actually Zero Knowledge about Chakma –Hajong issue. Peoples of State should avoid misusing the social media and wrong comments president Bagang said that if any one is not satisfaction with works of AAPSU than they should come up for discussion in any platform. Expressing unhappy over the silence on the issue, President Bagang Urged the all the legislators to unitedly pass a resolution against the granting citizenship rights to Chakma- Hajong refugee in this up coming State Assembly Session, which will be held on October 13 next. Fore the welfare of State indigenous people. He also urge the legislators of opposition party to be raise their voice strongly in coming Assembly and try to end this issue by passing a resolution in this season. 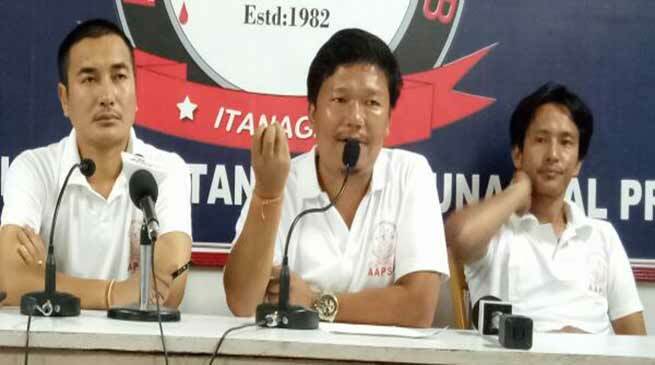 Bagang also said that it is very unfortunate that in Arunachal Pradesh state Assembly it was seems that the legislators of opposition party never raise voice against ruling party. Referring to the Tamil Nadu government, which had passed a bill in the state assembly that overturned the Supreme Court ban on the bull-taming sport Jalikattu, the Union asserted that the same can be done in the Arunachal on the citizenship issue. Continuing their demands for rollback of Tibetan Rehabilitation Policy-2014, Bagang said that AAPSU never accept the decision of the state to provide facilities like Job, Trading Licence, education policy etc to Tibetan of state. AAPSU also Demanded bring the one-point resolution taken during the All Party Meeting in to coming State Assembly and pass it, where in unison all present had rejected granting of citizenship to refugees in Arunachal. Also question Why has that resolution not been submitted to the Centre yet? Chakma-Hajong are not part of this indigenous land and on humanitarian ground they can be provided citizenship of India but they have to be deported from Arunachal soil which is the sole responsible of central government. Central government is randomly giving decision on Chakma –Hajong for granting citizenship in Arunachal Pradesh, they even don’t known the reality of chakma Hajong, who is doing many criminal activity here in Arunachal Pradesh and also many case on the chakma Hajong are pending till today. Threatening the central and state government AAPSU will boycott every Government of India offices even there will be restriction on plying of vehicles that belongs to Government of India if our demand is not fulfilled within stipulated time frame,’ said President AAPSU, Hawa Bagang. Further, AAPSU appealing all section of the people to cooperate with AAPSU in the fight against refugees.